From the Rocky Mountain News: Major Andrew Olmsted, who posted a blog since May 2007, was killed in Iraq on Jan. 3, 2008. Olmsted, who had been based at Fort Carson in Colorado Springs, began blogging after his unit was sent to Iraq with the mission of helping train the Iraqi Army. A sniper killed Olmsted as he was trying to talk three suspected insurgents into surrendering. A sniper’s bullet also cut down Capt. Thomas J. Casey. They were in Diyala province, northeast of Baghdad. Major Olmsted also posted at Obsidian Wings. Here is Freedom Isn’t Free to remember Andy Olmsted. Thank you. May you rest in peace. Can we afford to be the ‘Bank of Afghanistan R Us’ in the next 15 years? The American foreign policy establishment has identified a new national security problem. Over the past two decades, foreign-policy scholars and popular writers have developed the ideas that “failed states” present a global security threat, and that accordingly, powerful countries like the United States should “fix” the failed states. However, the conventional wisdom is based on a sea of confusion, poor reasoning, and category errors. The essence of strategy is effectively balancing ends, ways, and means. Squandering scarce resources on threats that exist primarily in the minds of policymakers is one indication that, as Richard Betts has pointed out, “US policymakers have lost the ability to think clearly about defense policy.”79 The entire concept of state failure is flawed. The countries that appear on the various lists of failed states reveal that state failure almost never produces meaningful threats to US national security. Further, attempting to remedy state failure—that is, embarking on an ambitious project of nation or state building—would be extremely costly and of dubious utility. Given these connected realities, policymakers would be wise to cast off the entire concept of state failure and to evaluate potential threats to US national security with a much more critical eye. Continue reading Washington’s Newest Bogeyman: Debunking the Fear of Failed States here from the Strategic Studies Quarterly. Also read the Failed States Index. Note that the US is at war in #6 Iraq and #7 Afghanistan and has poured gazillions of dollars to another country occupying the #10 spot, Pakistan. But there are other places “more failed” than where we have boots and money trees on the ground — Somalia, Zimbabwe, Sudan, Chad and the DAR, the top five countries in last year’s list. The 2009 list also includes Yemen as #18, Colombia as #41, China as #57 but does not include Mexico. Seriously. 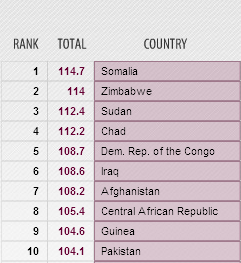 Table from Foreign Policy’s Failed State Index – view in full here. I watch with grave concern as I see the news of climbing military and civilian deaths in Afghanistan and with unease as money continues to pour like honey into Afghanistan, Pakistan and Iraq. In a few days, on June 7, this war will complete its 104th month in Afghanistan. It is now America’s longest war. Longer than Vietnam. According to iCasualties, the military deaths as of May 28 has claimed 1,007 souls. So many more wounded, so many more suffering the solitary stalker inside their heads. And all so very young it breaks your heart. Federal Funding For Higher Education — $1 trillion would give the maximum Pell Grant award ($5,500) to all 19 million U.S. college and university students for the next 9 years. Taxpayers in the Borough of Brooklyn, New York will pay $9 billion for total Iraq and Afghanistan war spending since 2001. That’s enough to supply renewable electricity to every household in Brooklyn for 19 years. Some food for thought and mental indigestion. How many more times can we still swipe our national credit card before it is finally declined? With soaring deficits and problems right on our doorsteps, right on our borders, how can this road be sustainable? How can we afford to be the ‘Bank of Afghanistan R Us’ in the next 15 years? If we start selling national properties to pay for these wars, might we stop and think twice before we write any more checks to “fix” these failed states? A Warrior’s Poem: "Murder–So Foul"
While cleaning out their father Sgt. James Lenihan’s basement after he died, Brooklyn, N.Y. based Rob Lenihan and his sister, Joan Lenihan, found this poem that he wrote about World War II. Lenihan was assigned to the 413th Infantry in the 104th Infantry Division, U.S. Army, nicknamed “the Timberwolves.” He toured Europe fighting. With the mantra, “nothing in hell must stop the Timberwolves,” the division was responsible for overrunning the Dora-Mittelbau concentration camp, and was later recognized as a liberating unit by the U.S. Army’s Center of Military History and the United States Holocaust Memorial Museum.